As a stormwater community, we have for years relied upon common urban stormwater hydrologic design methodologies and trusted their results. But, should we? 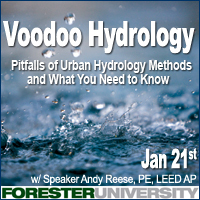 Join returning speaker Andy Reese as he exposes the black box of urban hydrology. In this webinar, Andy will (with his normal humor) “lay bare” the popular urban stormwater methodologies, as well as their key elements, assumptions, most common misuses, and proper application. Urban hydrology, including newer Green Infrastructure sizing approaches, as commonly practiced, is an inexact science at best. If we were omniscient, we could do an exact job of urban hydrology. Instead, we rely on engineering judgment and guesswork, ultimately striking a compromise between accuracy and data availability, and resulting in an answer that is close to correct. As such, understanding the inner workings of the black boxes and unstated assumptions inherent in urban stormwater hydrology that we commonly use (e.g., computer packages) is essential to ensure proper application. Join Andy in exploring the inner workings of some of the most popular urban stormwater methodologies, as well as their common misuse and misapplications. Through discussion of the associated elements and pitfalls, you will gain comprehensive understanding of urban stormwater hydrologic methods and their proper application to employ in your urban stormwater hydrologic design. If you are a stormwater plans reviewer, compliance officer, design engineer, consultant manager, professor, or attorney, this course is for you! The webinar will be on Thursday January 21st at 11 am PST. Click here for more information and registration.